No, I’m not talking about taking revenge on sea life; I’m talking about what we ate for dinner. I first made this dish back in my culinary school days in Cambridge. At the time, I thought it was very strange to be to go through all the trouble of cooking something only to later eat it cold, but I was wrong. I served up this cold dish with a cilantro herbed polenta that I first cooked like normal polenta and then grilled it up in preparation for the tilapia. The polenta was also delicious cold, so there’s no real reason why this whole dish couldn’t be prepared a day or two ahead of time. The eater also wanted to note that the tart, vinegar-y goodness of the raisin and nut mixture is very difficult to stop eating for long enough to get any leftovers. Coat both sides of fish in flour seasoned with salt and pepper. Heat a large skillet to medium high heat and pour in enough oil to coat the bottom of the pan. Fry fish on both sides to golden brown, about five minutes per side. Remove fish from pan and set in a shallow baking dish and reserve. Add vegetables to the pan used for frying the fish and cook about two minutes or until slightly softened. Add spices and cook for about one minute or until fragrant. 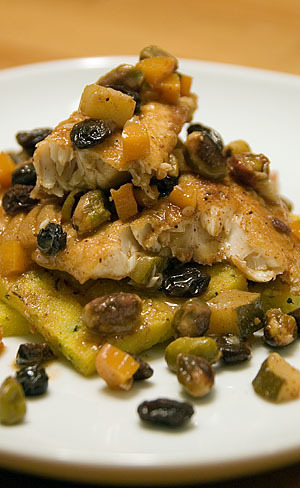 Add raisins, nuts, vinegar, and wine and cook over high heat until the liquid is reduced by half. Pour mixture into the baking pan with the fish. Let sit to allow the flavors to blend for 30minutes or place in refrigerator for a day or two. this is an intriguing dish. I have never had a cold fish dish before except sashimi and sushi. I shall give this a try. Thanks for the recipe! Can I use other vinegar instead of white vinegar?